There are currently 26 Wolf dual fuel and all gas ranges to choose from, and each Wolf range offers something different. It can be confusing when you consider the different range sizes, choice of gas or dual fuel, (even propane) and rangetop options. These include an infrared griddle, a double griddle, an infrared charbroiler and a French top. This guide will walk you through all of it and sort out what goes with what and why. You can use the table of contents here to go right to any section you may need to understand immediately, or just read through all of it now. How Iconic Is the Wolf Brand? What Is A Wolf Range? The Wolf brand may be one of the best brands in the world and is well known as one of the top brands in the “pro range” category. Headquartered in Minneapolis, Wolf has been a pioneer range manufacturer from its beginning. Wolf was established by brothers Al and Hyman Wolf in Los Angeles in 1934. These oven repairers were asked by restaurants to build them ranges to cook with rather than repair what was already available. Even then, the Wolf Company was focused on building high quality professional ranges. From their initial sales of commercial ranges to local area restaurants in Los Angeles, Wolf has grown steadily ever since. Wolf was one of the first to take its pro ranges to the home when it introduced its now iconic “pro-style” ranges for home use in 1990. The distinguishing feature of Wolf products is Wolf’s reputation for quality craftsmanship and design aesthetic. You can clearly see the quality in the design of the Wolf ranges. 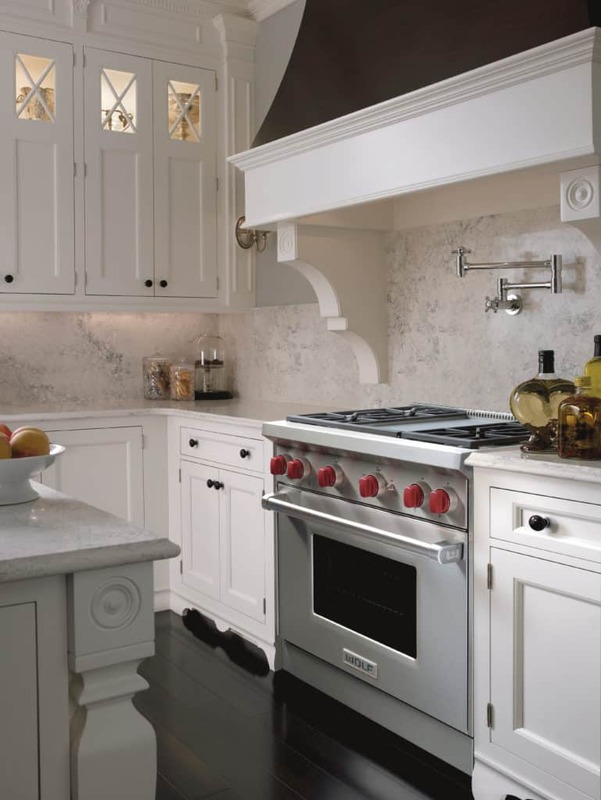 Many kitchen designers have actually designed kitchens around Wolf products. The fit and finish of Wolf ranges can also be heard as well as seen. When you shut the oven door on a Wolf range, there’s no rattle or vibration that might otherwise signal something shoddy. Wolf designs their ranges to last for more than 20 years, most other ranges do not. Wolf quality control tests ranges and range components under simulated heavy use at their factory. The simulation, or lab test, ensures that their ranges will stand up to almost any conditions. It’s worth remembering this Wolf design durability when you compare Wolf ranges with other, cheaper brands. Those cheaper brands that will likely only last a fraction of a decade. All you have to do is divide your cost by the number of years you expect it to last and you might find that Wolf ranges are a relative bargain. Wolf expanded its range line steadily as an independent manufacturer of commercial ranges over many decades. It introduced its “pro style” ranges for the home in 1990. In 2000, the Wolf home range division was acquired by Sub Zero, another iconic brand famous for its uniquely superb refrigerators. The remaining commercial Wolf corporation remains separately owned. The Wolf-Subzero “marriage” seems perfectly suited, with two of the best anchor brands in the kitchen now united in one company. Wolf hasn’t stopped since being acquired by Sub Zero with new line extensions including induction ranges and other Wolf appliances. Wolf ranges are a combination of ovens, rangetop features that vary based on the size of the range and all have the same iconic Wolf brand. The Wolf ranges come in four sizes, 30, 36, 48 and 60 inches. The 48 and 60 inch ranges each have two ovens. The ranges are either all gas or gas and electric (dual fuel) and have a mix of rangetop options. 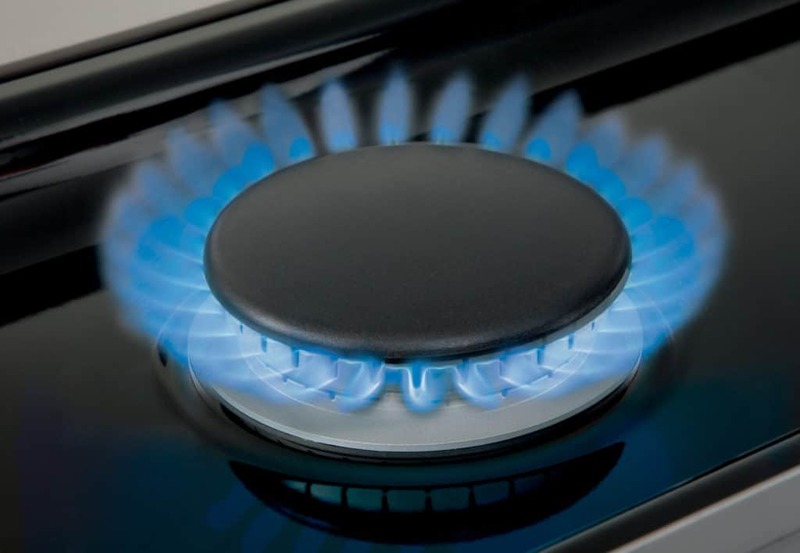 The gas components on every range (whether just on the rangetop or also in the oven) come configured for natural gas. However, each may optionally be configured for propane and even for high altitude. Starting with four burners in the 30 inch range, each larger range includes options such as Wolf’s infrared charbroiler or infrared griddle. A French top is also an option in the 48 and 60 inch ranges, as are double griddles. Wolf’s signature red knobs have become an icon in high-end range appliances (you can now get them in black or stainless steel if you want). They also have a practical use in precisely adjusting the dual stacked burners. Unlike most simmer settings, Wolf burners don’t turn on and off to maintain a low heat, they stay on at a consistently low temperature. Another recent feature in the dual fuel ranges is the pivoting control panel. Once you make your oven settings you can just push the control panel into the range and it will be out of sight, no one will know it’s even there! 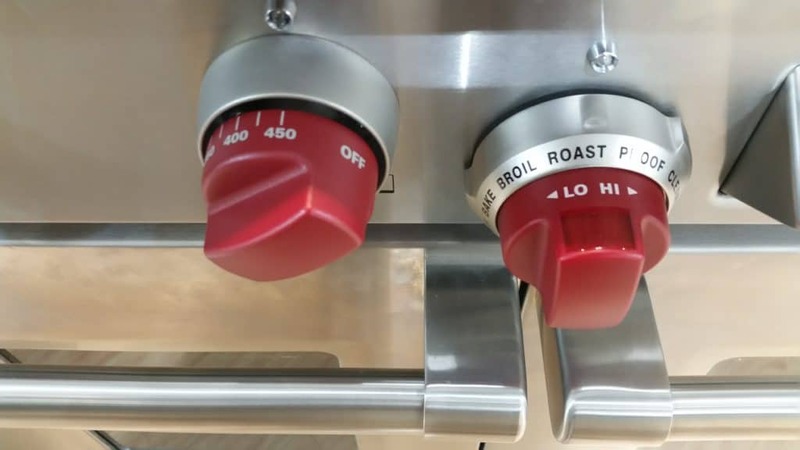 A built in temperature probe in the dual fuel ranges alerts you when your food has hit the right internal temperature, so you will now know when those tricky cuts are done without having to cut into them. You just have to set the right temperature on the control panel. The control panel in the dual fuel ranges includes timing options. 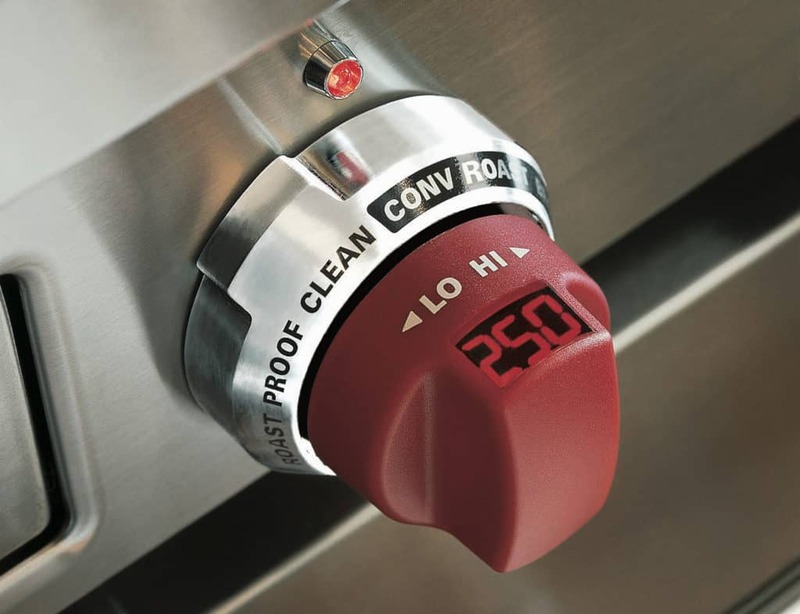 These options allow you to delay start times, set up to ten hours of timed cooking and self-clean. It also has a Star K compliant Sabbath mode. The multiple cooking modes include “Bake Stone”, “Proof” and “Dehydrate”. Additional dual convection modes include “Convection”, “Convection Bake”, “Convection Broil” and “Convection Roast”. Other modes include “Bake”, “Roast”, and “Broil”. Wolf has also re-designed their ranges to include heavy duty adjustable legs with casters in the rear legs that will help you move it should you need to. Also included recently, auto-spark re-ignition, so your burners will re-light if they flame out from a rare gust of wind or draft during cooking. 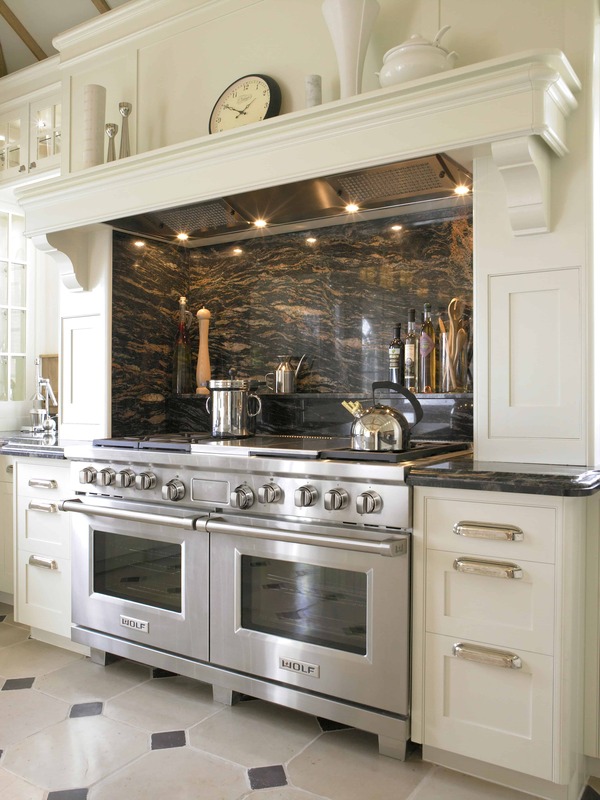 The Wolf rangetops feature a unique dual-stacked sealed burner system that is designed to provide a wide range of heat. The highest output is rated at 20,000 BTUs and uses both burner rings at full power. Alternatively, you can maintain a true simmer when when you engage just the lower burner ring for delicate cooking applications. Each burner is controlled by the flick of the range knob one way or another. Each burner is also fully adjustable within either the simmer or dual burner ring modes. Starting with the 36 inch ranges, the Wolf rangetops also give you different configurations. Different options include four, six or eight burners and other accessories. These include the infrared charbroiler and the 12 inch infrared griddle. The French top and double griddle is also included in the 48 and 60 inch ranges. The 16,000 BTU infrared charbroiler is a 12 inch grill that will give you the power to sear meat, fish or vegetables directly on it. The charbroiler is designed to allow the back 7 inches of the grill to have a lower temperature than the front, so you can rest your yakitori in the back after you cook it in the front. The infrared cooking system is very powerful and effective for surface cooking but will test your ventilation system. Make sure you’ve got enough capacity to handle the output of the charbroiler! Alternatively, the 15,000 BTU infrared griddle is not just for breakfast. The griddle is more than ready to cook a ribeye steak, shrimp, burgers, and almost anything else you might imagine cooking on a flat, uniform cooking surface. The single infrared griddle is powered by a 15,000 BTU burner to evenly heat the griddle surface. 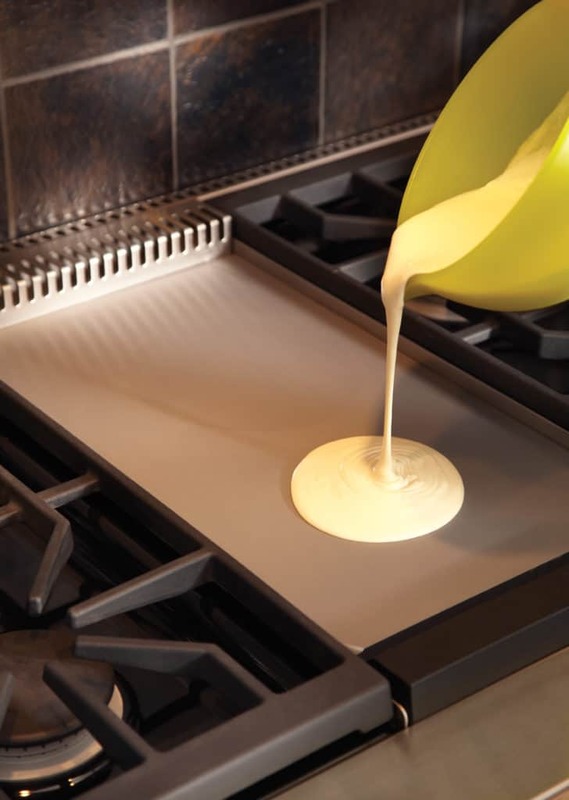 The larger ranges feature a 24 inch, 30,000 BTU double griddle option that is twice the griddle surface. The French Top option on the Wolf 48 and 60 inch ranges is designed to provide a flexible cooking surface. It is 22 inches wide and powered by a 15,000 BTU burner with concentric rings of heat. The higher heat and hotter temperatures are concentrated in the center ring. Lower temperatures on the French top are further out on the corners of the cooking area. The French top allows you to cook multiple dishes at different temperatures at the same time. The Wolf range line is split between dual fuel electric ovens and gas ovens. The infrared broiler in the gas ovens is rated at 18,000 BTUs. It will sear your favorite cut of steak to restaurant quality standards. 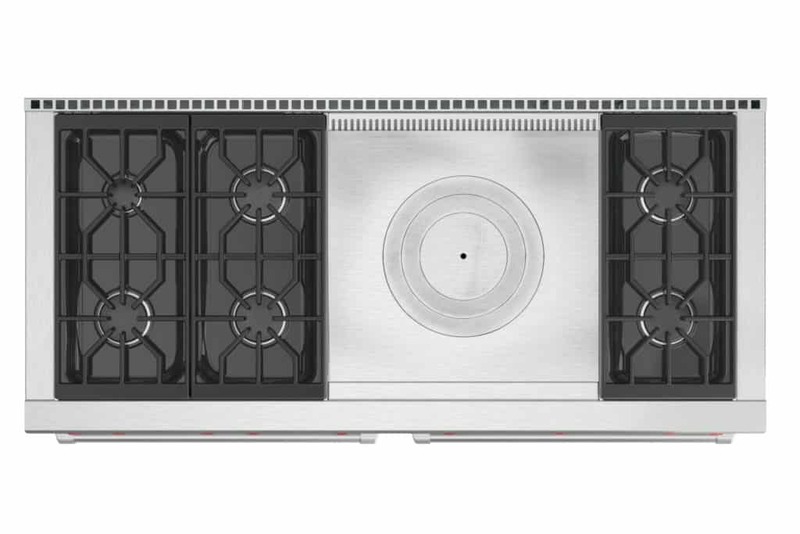 The bake burner element of the Wolf gas ovens is rated at 30,000 BTUs in the 30 inch 36 inch ranges. The same 30 inch oven is also part of the large oven in the 48 inch range and in each of the two ovens in the 60 inch range. The smaller 18 inch oven in the 48 inch ranges has a single 18,000 BTU burner. The 30 and 36 inch range ovens in each of the four range sizes have a single fan convection system (the electric ovens in the dual fuel ranges have dual fan convection systems, one reason they cost more). The 18 inch oven in the 48 inch gas range does not include convection, only in the electric oven in the dual fuel ranges. 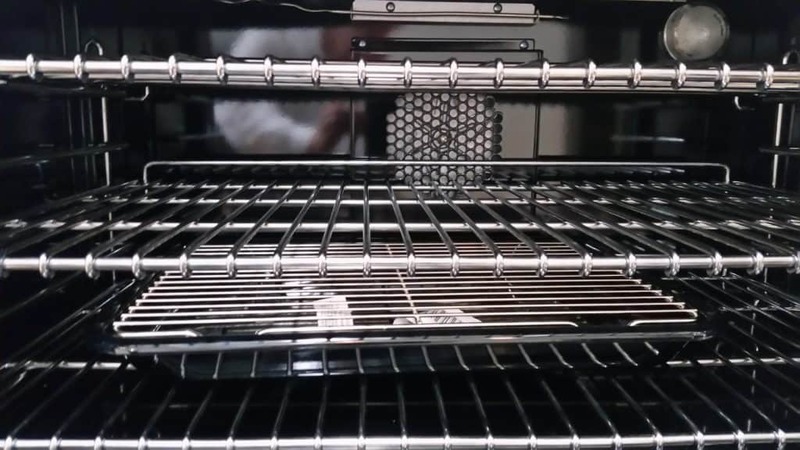 The 30 inch and 36 inch ranges each have an inner and outer bake element hidden in the floor of each oven. The bake element for both the 30 and 36 inch ranges has an inner element rated at 1,000 watts (for 240 amps) and an outer rated at 1,200 watts. The broil element in the 30 inch range is 3,600 watts, while the 36 inch range has a powerful, 8-pass, 4,000 watt broil element. The smaller 18 inch oven in the 48 inch range has a 2,000 watt, 4-pass, broil element and 1,450 watt bake element. The broilers element is 8-pass in all of the ovens except the 18 inch oven, which is 4-pass. The larger oven in the 48 inch range and the two ovens in the 60 inch range each have the same 30 inch range oven with a 3,600 watt broiler element the top of the range and in the floor of the oven, a 1,000 watt inner bake element and 1,200 watt outer bake element. Wolf doesn’t really detail the number of passes in each of their electric ovens or the power of the electric elements. It is, however, important to know how much power and passes these ovens deliver when considering living with these ovens for 20 plus years! There are fourteen different dual fuel ranges, starting with the 30 inch range (just one model) and then three 36 inch range models, followed by five 48 inch ranges and five 60 inch ranges. The 30 inch dual fuel range (the DF304) features an electric oven with two convection fans. Each convection fan has its own heating element for really high quality heat/air distribution. The DF304 is also equipped with four sealed burners, rated at 9,200 BTUs, 15,000 BTUs, 18,000 BTUs and 20,000 scorching BTUs for your highest heat applications. It weighs about 325 pounds. The grates across each of the burners and between them are continuous. The grates combine to create one continuous cooking area across the entire range. The 30-inch range oven features two convection fans for absolutely smooth heat distribution. The interior of the oven is 2.8 cubic feet of usable space, but as measured by industry standards the interior space is over 4.5 cubic feet. This is good to know when comparing to other brands. The difference between these two measurements is that the smaller measure deducts space taken up by oven racks and other components. The interior measures 25 inches wide, 16 ½ inches high and 19 inches deep. The 36 inch ranges feature Wolf’s largest electric oven and dual convection fans. 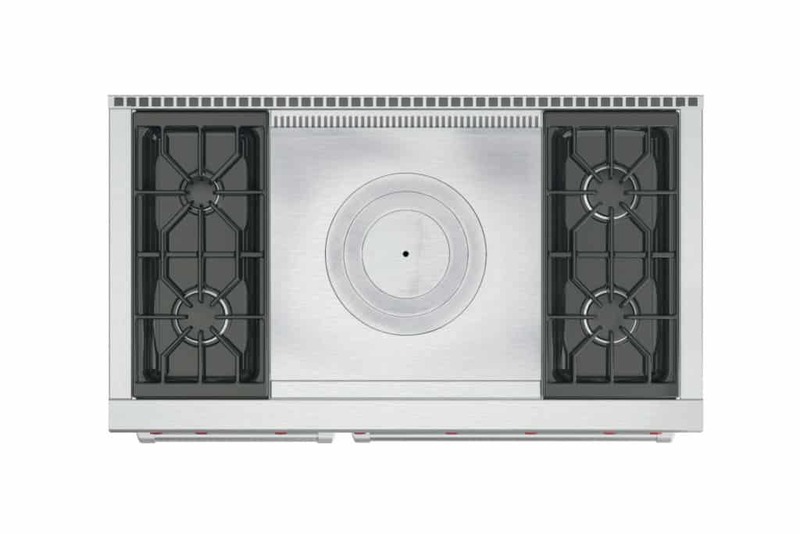 Each fan has its own heating element to make sure that your heated oven air is evenly spread. 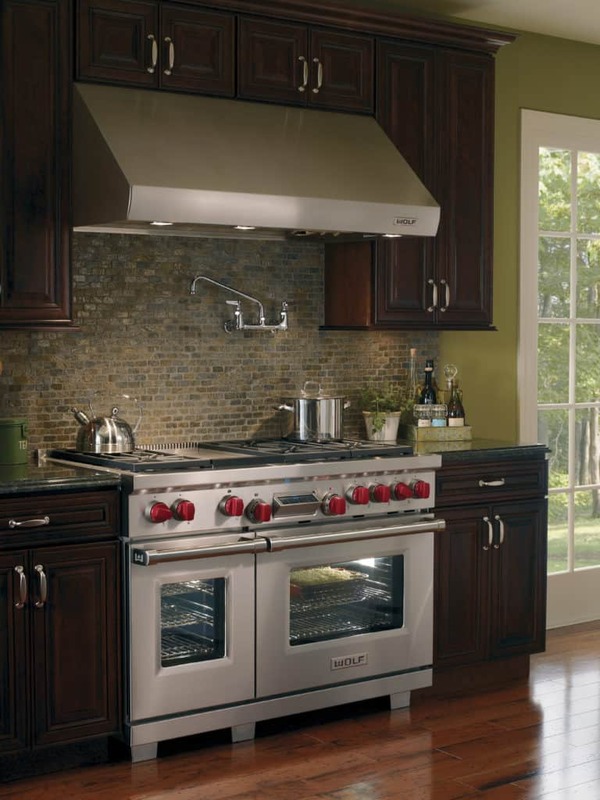 The 36 inch range ovens have a usable interior space of 3.5 cubic feet and total interior space of over 5.4 cubic feet, use this second measure when comparing the interior space with other brands.The smaller measurement tells you how much food and cookware you can fit inside your oven, given space taken by racks and other oven components. These ranges have an interior width of 30 inches, a usable height of 16 ½ inches and a usable depth of 19 inches. 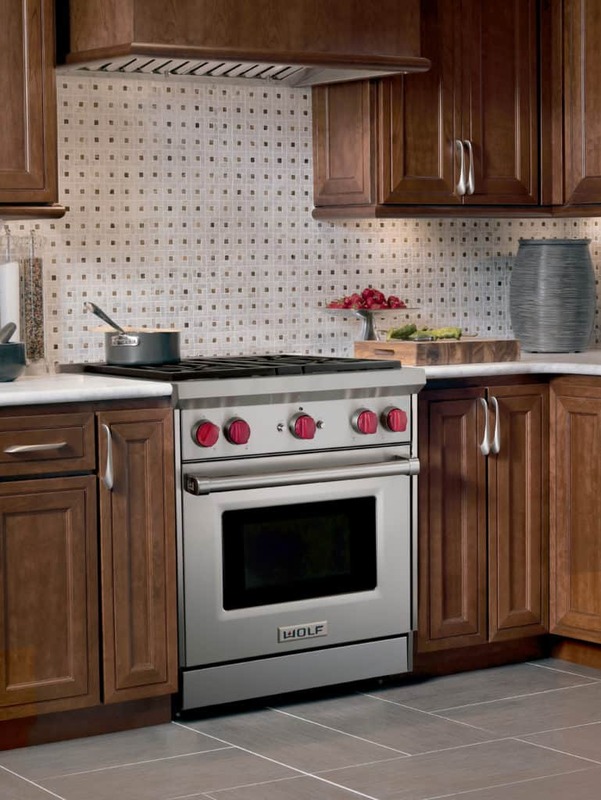 The 36-inch range line includes two models with four burners and one with six. The DF364C range has four burners (a 9,200 BTU burner, a 15,000 BTU burner, a 18,000 BTU burner and a 20,000 BTU burner). It also has an infrared charbroiler and weighs about 445 pounds. The DF364G range has four burners (a 9,200 BTU burner, a 15,000 BTU burner, a 18,000 BTU burner and a 20,000 BTU burner). It also has an infrared griddle. It weighs about 470 pounds. The DF366 range has six burners (a 9,200 BTU burner, two 15,000 BTU burners, two 18,000 BTU burners and a 20,000 BTU burner). It weighs about 445 pounds. 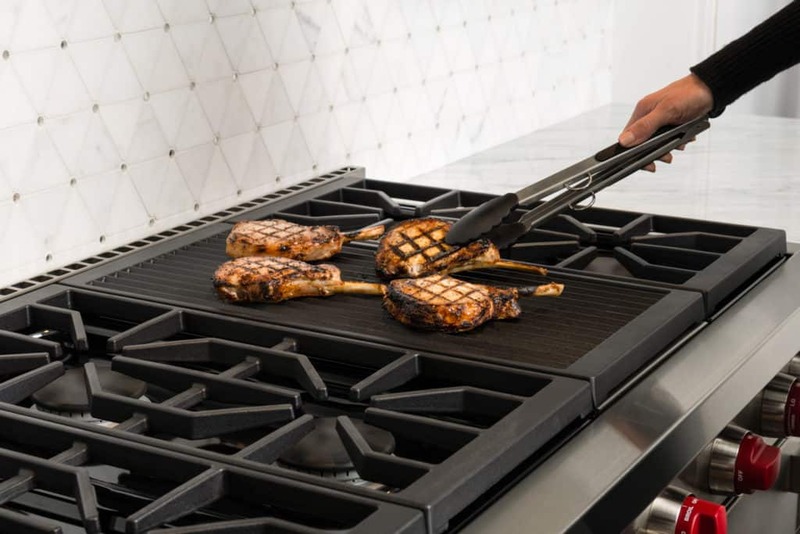 The 48 inch range models allow you to mix and match griddle and charbroiler options, and include another option: the French top. The two electric ovens in the 48 inch ranges are a 30 inch larger main oven and smaller 18 inch secondary oven, both of which are convection ovens. The larger oven is double convection and the smaller oven has a single convection fan. The four burner range models have the same configuration for each burner (9,200, 15,000, 18,000 and 20,000) as in the smaller ranges. There is an additional 15,000 and 18,000 BTU double stacked burner in each of two different six burner range models. The DF484CG range has four burners and both the infrared griddle and infrared charbroiler. It weighs 685 pounds. The DF484DG range has four burners and a double-sized infrared dual griddle. It weighs 725 pounds. 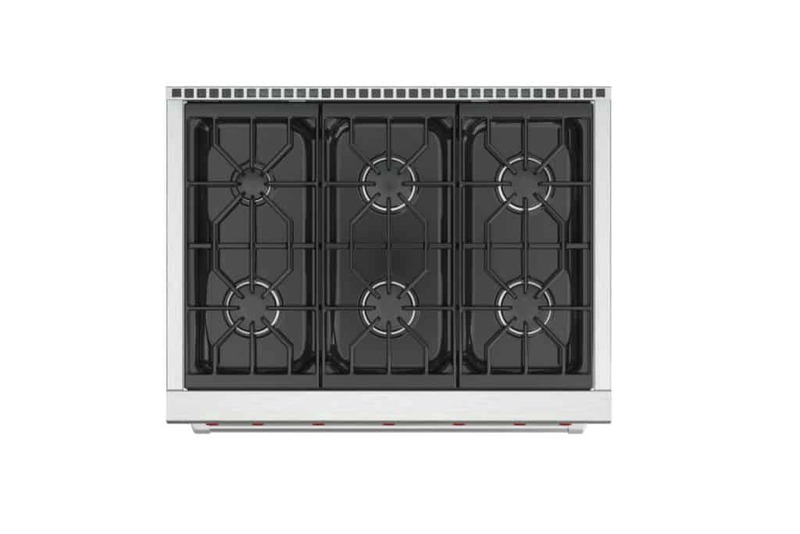 The DF484F range has four burners and the 15,000 BTU French top. It weighs 750 pounds. 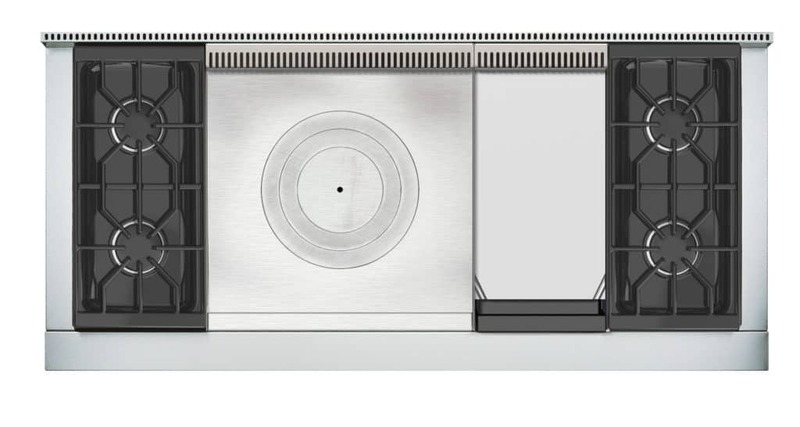 The DF486G range has six burners and the infrared griddle. Two burners are housed on the far left, next to the griddle and four burner with continuous cast iron grates are on the right side of the range. The range weighs 685 pounds. 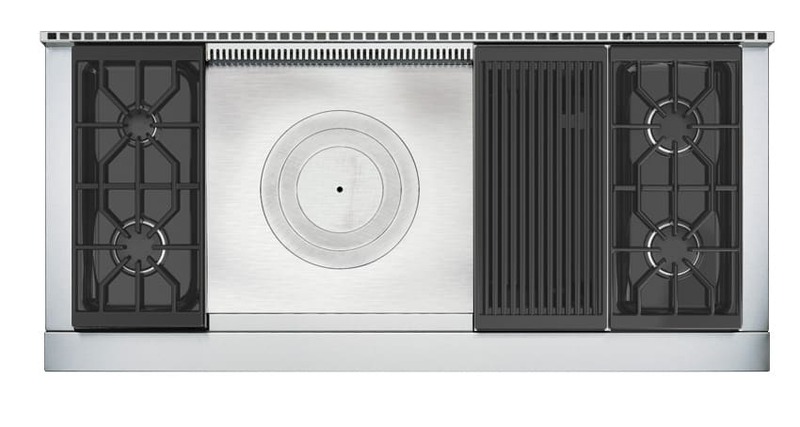 The DF 486C has six burners and the infrared charbroiler. Four burners are on the left side, followed by the charbroiler and two burners on the far right side of the range. This range weighs 665 pounds. The larger oven’s interior is 2.8 cubic feet of usable space, the total interior oven space is over 4.5 cubic feet. The interior measures 25 inches wide, 16 ½ inches high and 19 inches deep. The 18 inch oven has 1.5 cubic feet of usable area, but its total oven interior is over 2.5 cubic feet. The interior measures 14 inches wide, 16 ½ inches high and 19 inches deep. The difference between these interior measures is that the larger measure measures each oven’s cavity. This measurement is most often used by other brands when detailing their interior oven space, so use this larger measure when comparing interior oven space with other brands. The smaller measure deducts for racks and oven components and gives you a much more accurate measure of how much space you have to fit food and cookware in your oven. The five 60 inch range models feature two equally sized double convection ovens, each are the same 30 inch oven as in the 30 inch range. Each of the two ovens in each 60 inch range provide 2.8 cubic feet of usable oven space, and well over 4.5 cubic feet in total interior oven space. Use this larger measure if you’re comparing Wolf oven interiors with other brands, since they mostly report their interiors by total interior space. The smaller measure, however, deducts space taken up by racks and other oven components. Use this measure to give y0u an accurate measure of how much room you have in your ovens for food and cookware. The interior measures 25 inches wide, 16 ½ inches high and 19 inches deep. Each oven has two convection fans to provide even heat and no hot spots. The DF604CF range has four dual-stacked sealed burners (one 9,200 BTU, one 15,000 BTUs, one 18,000 BTUs, one 20,000 BTUs). It also has a 16,000 BTU infrared charbroiler and a 15,000 BTU French top and weighs 950 pounds. The DF604GF range has four dual-stacked sealed burners (one 9,200 BTU, one 15,000 BTUs, one 18,000 BTUs, one 20,000 BTUs). It also has a 15,000 BTU infrared griddle and a 15,000 French top. It weighs 950 pounds. 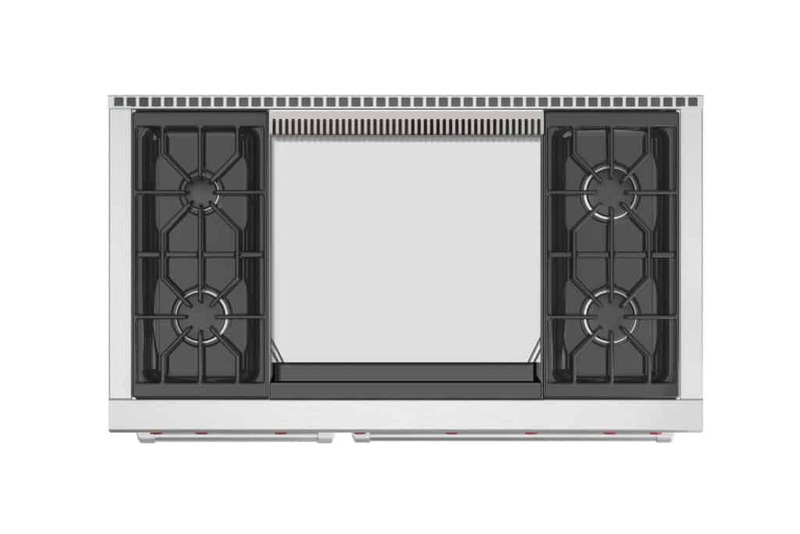 The DF606CG range has six dual-stacked sealed burners (one 9,200 BTU, two 15,000 BTUs, two 18,000 BTUs, one 20,000 BTUs). It has a 16,000 BTU infrared 16,000 BTU charbroiler and a 15,000 French top and weighs 875 pounds. The DF606DG range has six dual-stacked sealed burners (one 9,200 BTU, two 15,000 BTUs, two 18,000 BTUs, one 20,000 BTUs). It also has a 30,000 BTU double griddle, and weighs 875 pounds. The DF606F range has six dual-stacked sealed burners (one 9,200 BTU, two 15,000 BTUs, two 18,000 BTUs, one 20,000 BTUs). It also has a 15,000 BTU French top. It weighs 950 pounds. The MSRP is $16,865. Wolf recently updated the all-gas range models to match the pro-range design of the dual fuel models. 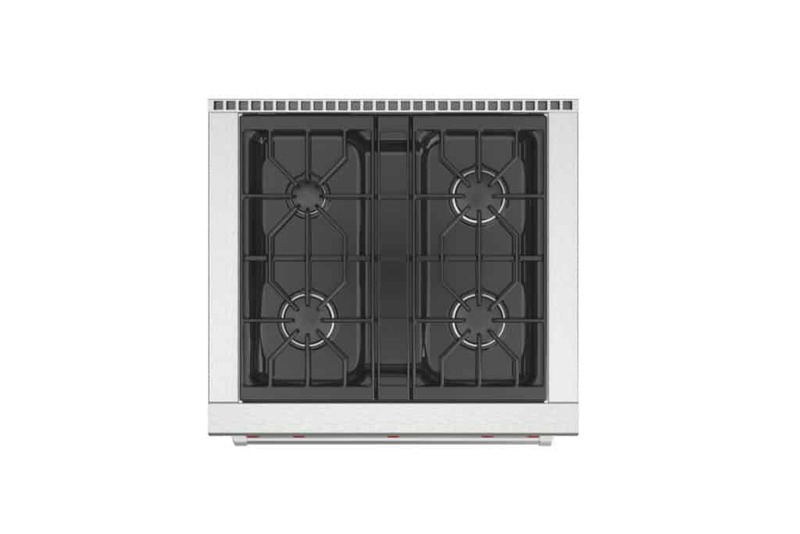 There are twelve all gas range models to choose from, starting with the 30 inch wide all gas range. This single model is followed by three different 36 inch range models, five 48 inch range models and three 60 inch range models. The gas ranges have been configured with one 9,200 BTU burner, while the rest are 15,000 BTU burners. All of the burners are dual stacked, sealed burners. Each burner produces a sustained, adjustable simmer when one gas ring is engaged. When both gas rings engaged, the full power of each burner can be achieved. The ovens in the all gas models include an 18,000 BTU infrared broiler of direct scorching heat. This heat will let you sear your food like a commercial kitchen does. The ovens also feature a 30,000 BTU burner for the other cooking modes. 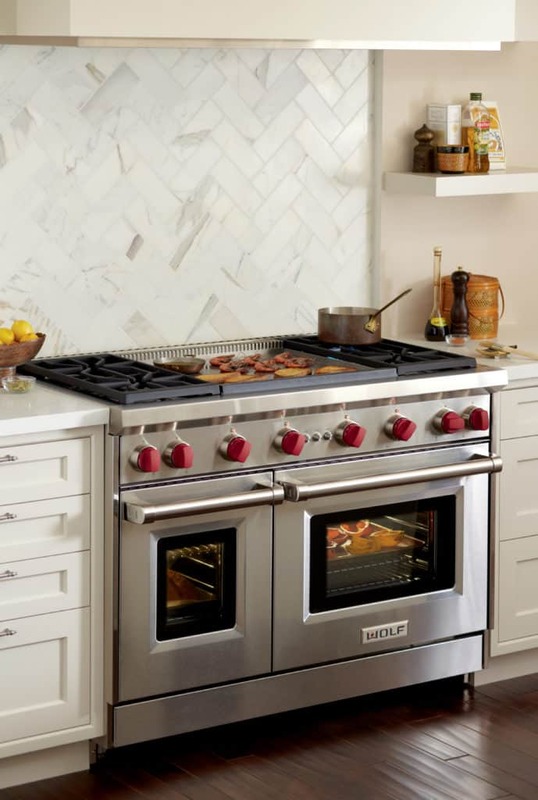 The 30 inch and 36 inch ovens in each of the four Wolf gas range sizes have a single fan convection system. This system does not have its own heating element, unlike the electric ovens in the dual fuel ranges that do. The 18 inch oven in the 48 inch gas range does not have a convection fan. 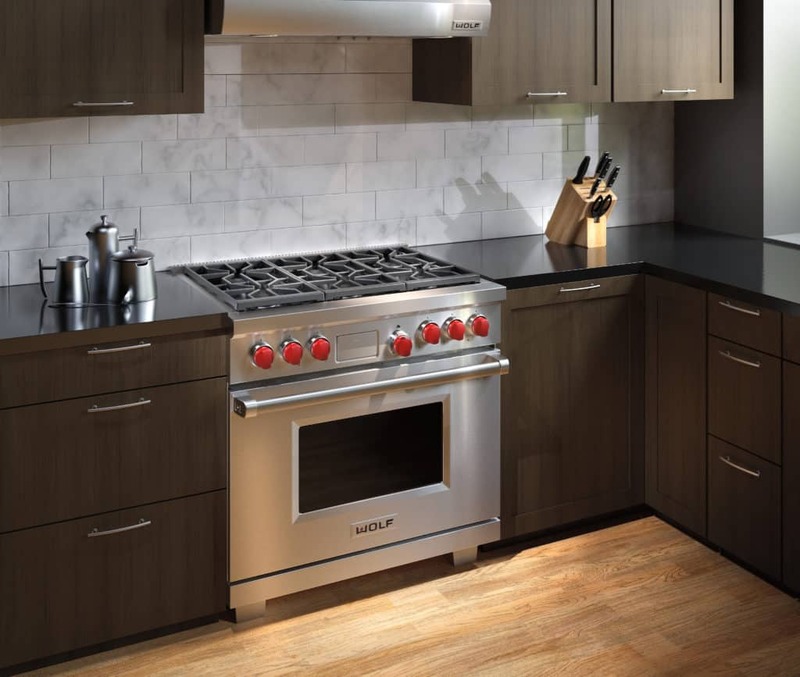 The 30 inch gas range (the GR304) has 2.9 cubic feet of usable interior oven space, and the interior cavity of the oven measures 4.4 cubic feet.This second measure is what to use when comparing interior oven space with other brands, since that’s how most manufacturers describe their interior oven space. The smaller measure is what you need to understand for your cooking requirements. This measurement deducts oven space that you can’t use, like space taken by oven racks, to give you an accurate measure of how much space you have for food and pans in your oven. The interior oven measures 24 inches wide, 18 5/8 inches high and is 17 inches deep. It also includes a single convection fan. This oven is a bit larger than the Wolf 30 inch electric range, which has 2.8 cubic feet of usable interior space. 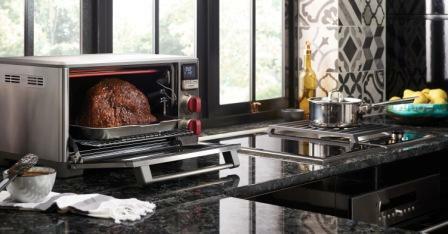 The oven has a 18,000 BTU infrared broiler that will sear like your favorite steakhouse does. It also has four burners on the rangetop and an additional 30,000 BTU oven burner. 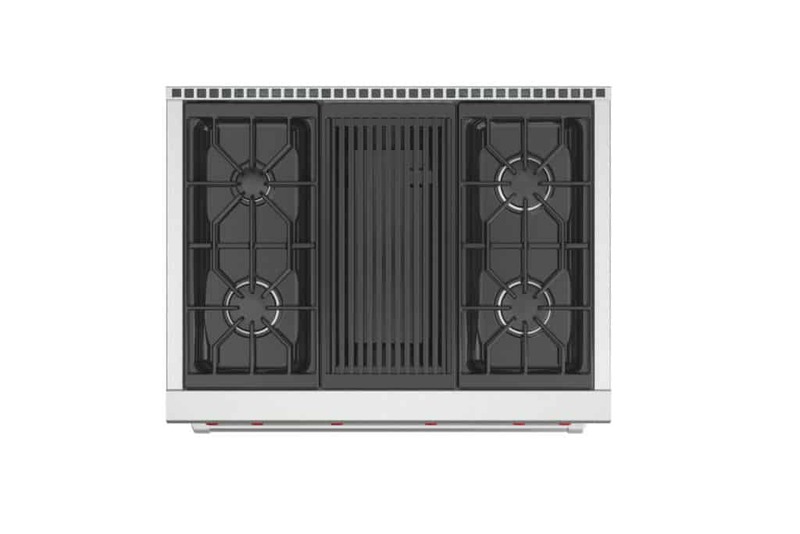 The GR304 range features four burners in a continuous cast iron grill grate system. This range weighs 325 pounds. The 36 inch gas ranges sear, broil and bake with an 18,000 BTU infrared broiler and 30,000 BTU oven burner, the same as the 30 inch oven. The 36 inch oven in the gas range has the most interior usable space of any Wolf oven. It measures 3.7 cubic feet of usable interior space, and 5.5 cubic feet of total interior space. The smaller measurement tells you how much stuff you can fit in your oven given the racks and other components. The larger measurement is what you should use when comparing interior oven space with other brands, since they typically base their measurements on total interior space. The oven interior measures 30 inches wide, 18 5/8 inches high and 17 inches deep. The GR364C range has four dual-stacked burners (one 9,200 BTU and three 15,000 BTU). It also has a 16,000 BTU infrared charbroiler and weighs 445 pounds. The GR364G range has four dual-stacked burners (one 9,200 BTU and three 15,000 BTU). It also has a 15,000 BTU infrared griddle, and weighs 470 pounds. 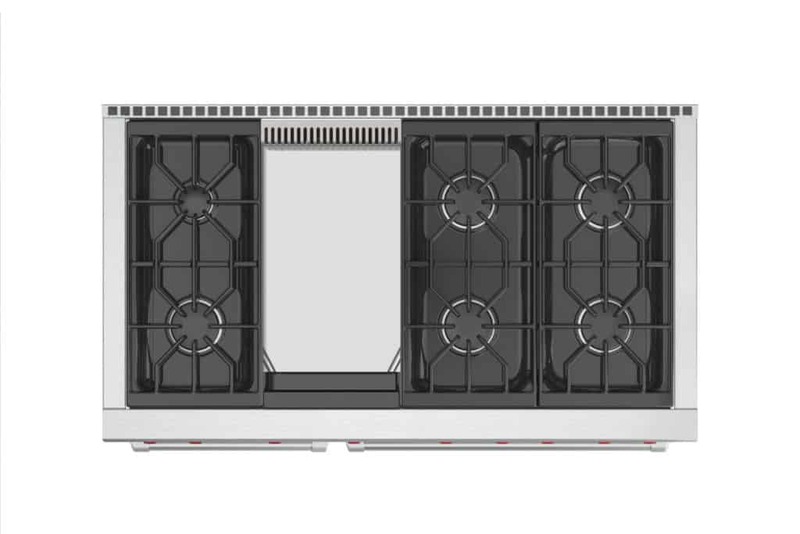 The GR366 range has six dual-stacked burners (one 9,200 BTU and five 15,000 BTU). It weighs 445 pounds. 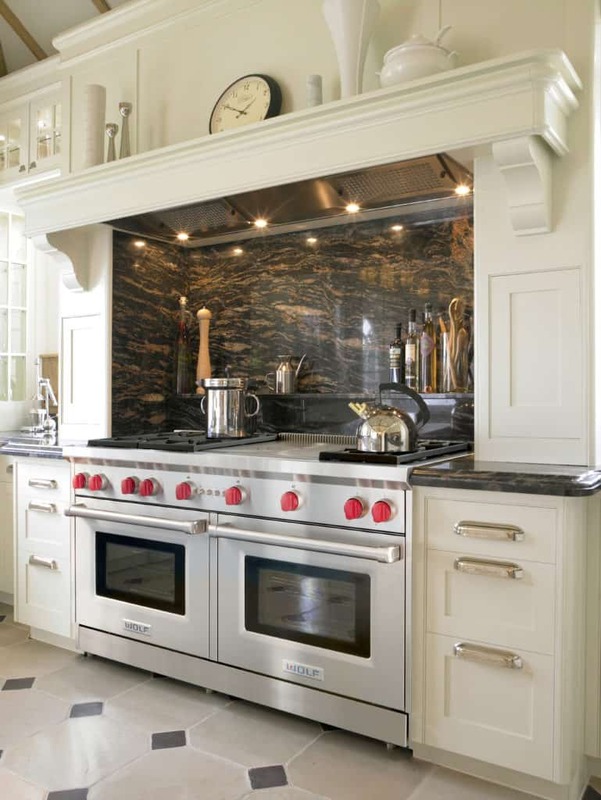 The 48 inch gas ranges have two ovens, one smaller than the other. The larger convection oven has 2.9 cubic feet of usable interior space and in total, the interior measures 4.4 cubic feet. 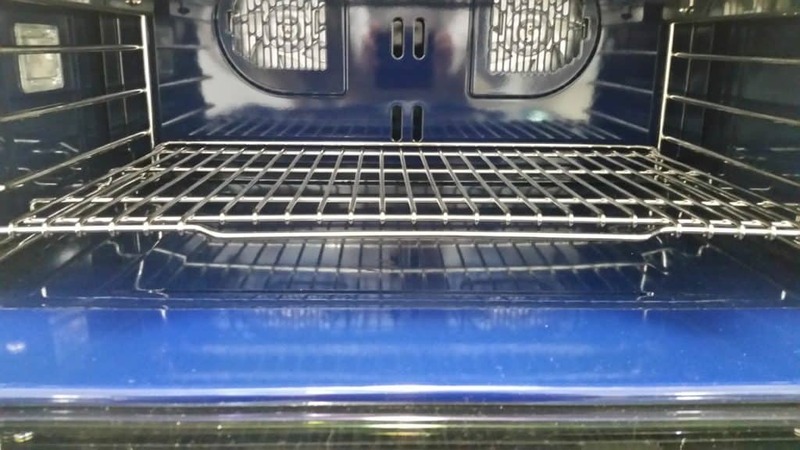 The usable space takes deduct space you can’t use, like oven rack space, to give you an accurate measure of what you can actually fit in your oven. The total interior measurement, the larger number, is how other brands usually describe how big their oven interiors are. So, you should use this measurement when comparing this oven with other brands. It is 24 inches wide, 18 5/8 inches high and 17 inches deep. The larger oven also has a searing high-temperature 18,000 infrared broiler in addition to the 30,000 BTU oven burner. The smaller oven is non-convection and has 1.6 cubic feet of usable interior oven space and the interior in total is almost 2.5 cubic feet. Again, use the small interior measurement to know how much you can fit in your oven and the large interior measurement when comparing this oven interior to other brands. The interior oven measures 13 1/2 inches wide, 18 5/8 inches high and 17 inches deep and has an 18,000 BTU oven burner. 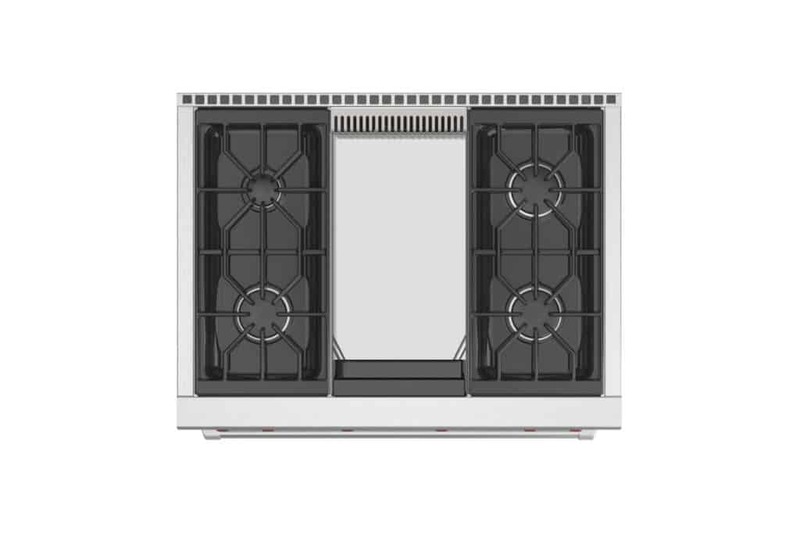 The GR484CG range has four dual-stacked burners (one 9,200 BTU and three 15,000 BTU). It also has a 16,000 BTU infrared charbroiler and the 15,000 BTU infrared griddle and weighs 700 pounds. The GR484DG range has four dual-stacked burners (one 9,200 BTU and three 15,000 BTU). It also has a 30,000 BTU infrared double-griddle and weighs 725 pounds. 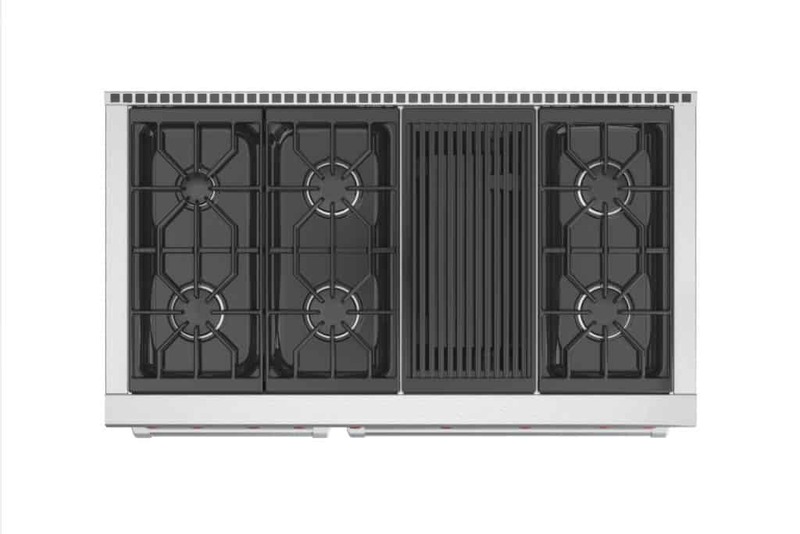 The GR486C range has six dual-stacked burners (one 9,200 BTU and five 15,000 BTU). It also has a 16,000 BTU infrared charbroiler and weighs 665 pounds. 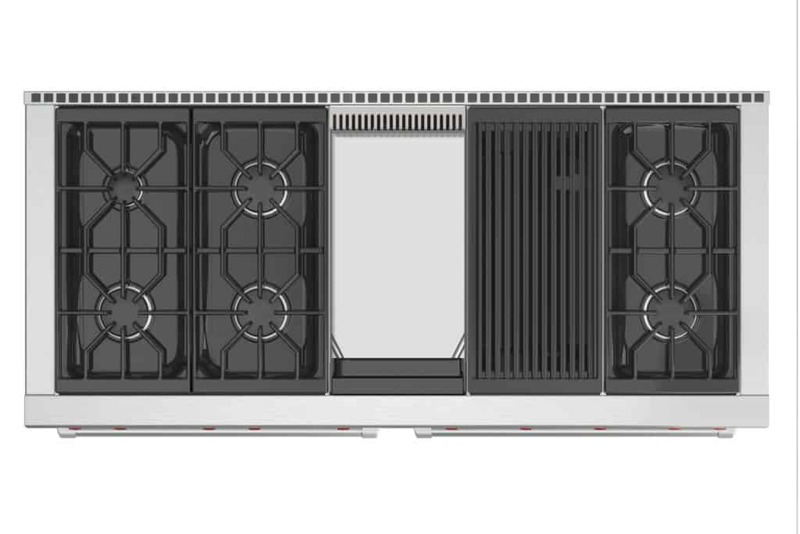 The GR486G range has six dual-stacked burners (one 9,200 BTU and five 15,000 BTU). It also has a 15,000 BTU infrared griddle and weighs 685 pounds. 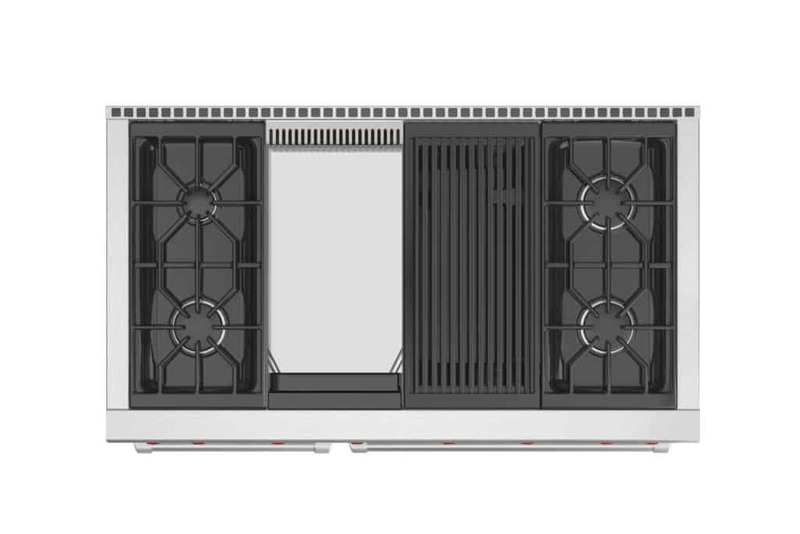 The GR488 range has eight dual-stacked burners (one 9,200 BTU and seven 15,000 BTU). It weighs 650 pounds. The 60 inch range gas double ovens are big, each with 2.9 cubic feet of usable interior oven space and each oven interior measures 4.4 cubic feet. Each of these ovens are convection ovens. The difference between the usable oven space and the larger interior oven measurement based on what you can actually fit in your oven versus the size of the oven “box” itself. You have to deduct the size of oven racks and other components that are already inside the oven to give you a clear measurement of how much food and cookware you can fit inside. The larger interior size (4.4 cubic feet) should be used when you’re comparing interior oven space between Wolf and other brands. Most other brands report their interior oven space using this total size. They measure 24 inches wide, 18 5/8 inches high and 17 inches deep. 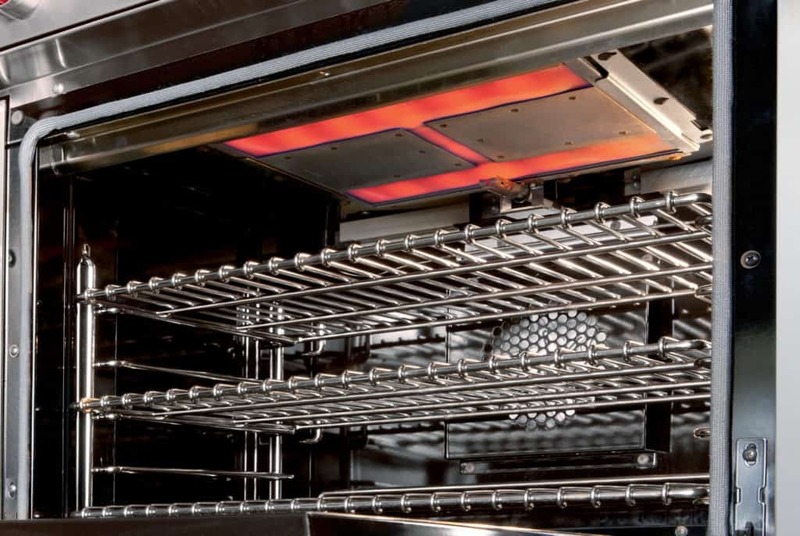 Most importantly, each oven has a 18,000 scorching infrared broiler in addition to the 30,000 oven burner. 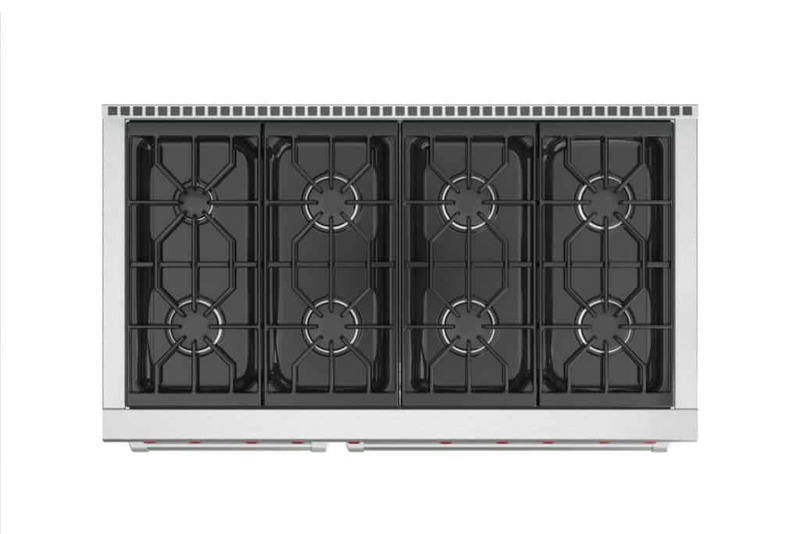 The GR606CG range has six dual-stacked burners (one 9,200 BTU and five 15,000 BTU). It has a 16,000 BTU infrared charbroiler and the 15,000 BTU infrared griddle and weighs 875 pounds. 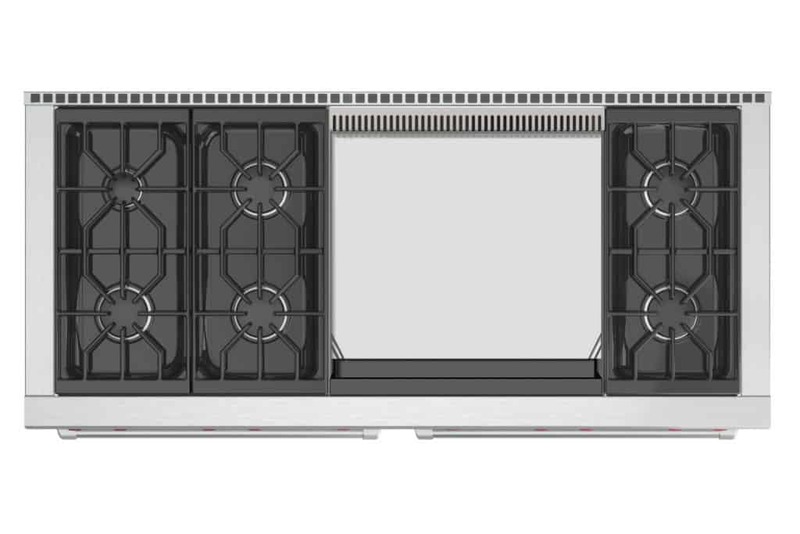 The GR606DG range has six dual-stacked burners (one 9,200 BTU and five 15,000 BTU). It has a 30,000 BTU infrared double-griddle and weighs 900 pounds. The GR606F range has six dual-stacked burners (one 9,200 BTU and five 15,000 BTU). It also has a 15,000 BTU French top. This range weighs 950 pounds. The warranty for Wolf ranges is two years from the date of installation. All parts and labor are covered to repair or replace defective parts through defective materials or workmanship. This warranty applies as long as the defective range was not used commercially, i.e. for residential use. Any service covered under the warranty must be certified by Wolf, unless Wolf specifies differently. Additionally, a limited warranty applies for five years from installation. This limited warranty applies to specific parts or workmanship that is deemed defective. These specific parts are: gas burners (except their appearance), electric heating elements, electronic control boards, and any magnetron tubes and induction generators. You will be responsible for labor costs if you use Wolf certified service. Wolf will cover the cost of parts. If you use service that isn’t Wolf certified, then you will have to contact Wolf to receive the specific replacement parts and replace at the your expense. Wolf won’t reimburse you if you buy the parts from non-certified sources. You should also note that the warranty only applies to ranges installed in the United States or Canada. It doesn’t cover replacement of parts damaged or made defective through negligence, accident or other improper methods or improper installation. Some state laws may change these warranty terms. Use the bake stone kit with the bake stone cooking mode (in all ovens but the small oven in the 48 inch range). Not just for pizza, a bakestone is a great accessory to help maintain even oven temperatures. 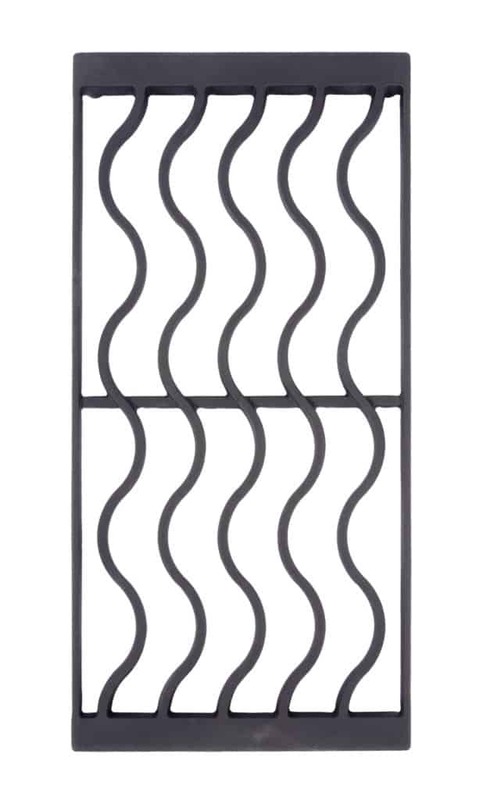 Cast iron S-grates are an optional grate accessory if you want a different grate configuration than the standard. A high altitude conversion kit. This kit is needed if you are above 10,250 feet in elevation and using natural gas, or above 8,600 feet and using propane gas. There are other things to keep in mind regarding high altitude cooking. A dehydration kit with racks and an oven door stop for use in the dehydrate mode. Dehydration mode is used to dry fruits, vegetables and other foods with a lot of water, including meat for beef jerky. Wok grate, for wok cooking. Stainless steel kickplate to go at the bottom of the range. Alternative control knobs: stainless steel or black, standard is Wolf’s iconic red knobs. 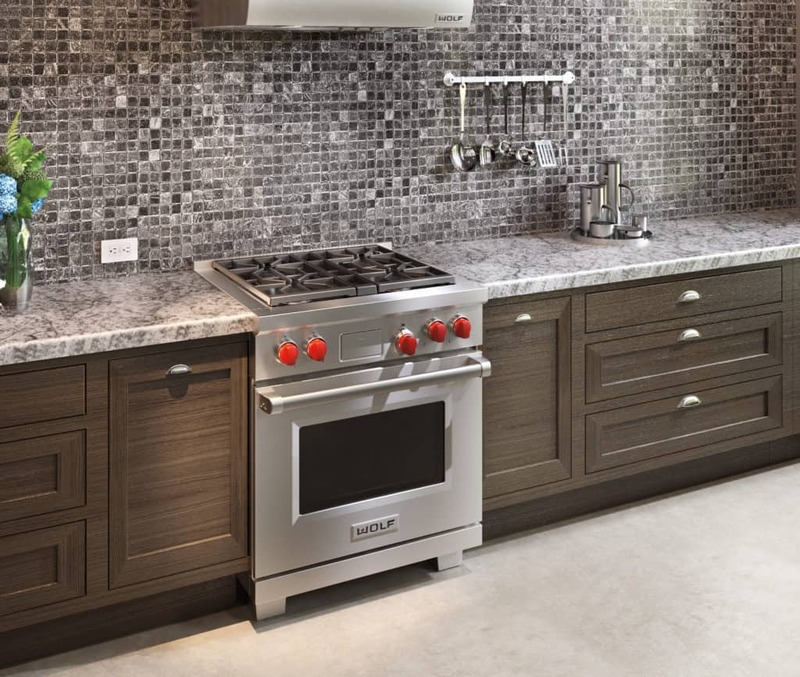 Wolf introduced a new line of premium countertop appliances and cookware, known as Wolf Gourmet, in 2014. This video will give you a brief overview of the Wolf Gourmet products, or just continue reading for more detailed information. These appliances and other kitchen tools were developed in collaboration with leading small appliance brand Hamilton Beach Brands, Inc. Wolf intends for the Wolf Gourmet line to maintain the same quality and iconic product finishes in its small appliances and other products as it does in its large ranges, ovens and cooktops. The Wolf Gourmet appliances as of now include a countertop oven with convection, temperature probe and a bunch of cooking modes, a very powerful blender (the Wolf Gourmet High-Performance Blender – see it here with other top rated blenders) that spins its blades at over 210 miles per hour and two very solid toasters. Wolf has put its name and reputation for quality on the line with these small appliances, so I expect they will maintain the same level of quality as the rest of the Wolf products do. They even feature Wolf’s iconic red knobs, along with a 5-year warranty, where other small appliances brands typically only provide a 1-year warranty. Wolf Gourmet countertop appliances currently include a very powerful countertop oven with Wolf’s iconic red knobs, the WGCO100S. Alternatively, you may choose black knobs (WGCO110S) or brushed stainless (WGCO120S). Read the full review here for a comprehensive understanding of the Wolf Gourmet Countertop Oven and a summary of the other Wolf Gourmet small appliances, the premium blender and the two and four slice toasters. We hope you enjoyed this comprehensive product guide, thanks for stopping by!